I decided to make this award for the fun of it and to show that our animal friends are appreciated! I think that there are many people out there who feel about their animals the way that I do, and this is for them. There are no restrictions on the type of animal whom can receive this award. It is for any loving friend, large or small, that holds a special place in your heart! Your site must be child and animal friendly and have no offensive material. Must be pet orientated and not only based upon links, webrings, or pictures. Please Sign Our Guestbook. A great way to win points and so I know that you actually spent some time looking at our pages and not just applying for the award. If you win the award, you must make the award a link back to this site at http://www.ndrc.tripod.com It would be nice if people knew where you got it from just in case! 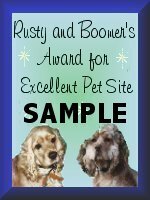 To submit your page as a candidate for Rusty And Boomer's Award, complete this form and submit it. We will take a look at your page, and if it qualifies, we will email you. If you do not receive and email back within 2 weeks you did not receive the award. Thank you for applying for this award and Good Luck! If you have problems with the form and cannot send it you may send an email with all the information you would have supplied in the form. We will visit your site as soon as possible.